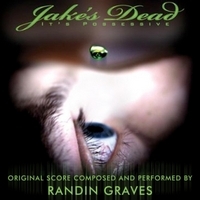 Randin Graves created the totally original, award-winning score for the horror/psychological drama feature film 'Jake's Dead' using many of his diverse musical skills. He is widely known as a didgeridoo player, and effected didgeridoo (a la his 2001 album 'Didgital') is a crucial part of the sonic identity of 'Jake's Dead.' He is also a guitarist, and used electric and acoustic guitars to great effect in the score, particularly ebowed fretless electric guitar, an instrument he made himself. He started as a self taught keyboardist, and atmospheric synth and samples of his own creation are crucial to the sound of the film. Lastly, he's classically trained with a degree in music composition. Orchestra completes the sound of the film. It's fitting that the first full feature score he completed allowed him to integrate all these varied musical experiences. The score and the film begin with Jake returning home for his father's funeral, so the opening cue lets us know we're about to embark on an emotional journey you may not expect from a "horror film." Along the way we get reflection, romance, horror and action and a truly enjoyable listening experience. The score is detailed and layered, with themes for most of the major characters and major concepts in the film, used in an almost operatic way, as in Howard Shore's "Lord of the Rings" scores. The album is 66 minutes, selected from over 90 minutes of score in the nearly 2-hour film. Randin never heard any temp music while working on the film, so you can be sure this isn't another soundtrack album that ends up sounding like all the others, but an original work from a first time feature composer with a wide musical background to draw from. Enjoy!